I’ve used bleached painters drop cloth for many projects in my time. 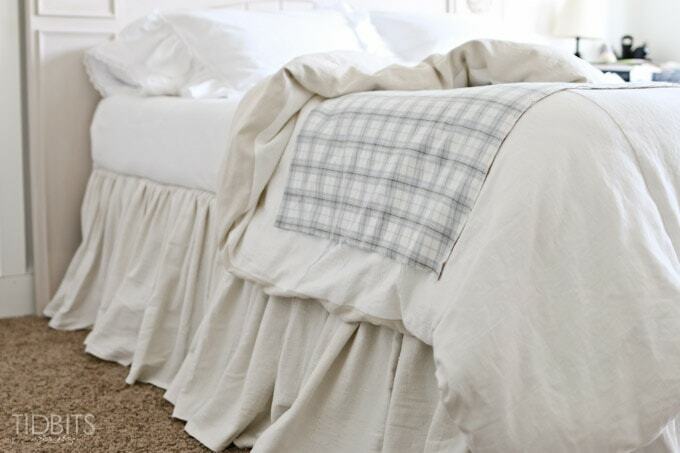 I can’t help but love the soft, textured, linen-like, look and feel of drop cloth – and especially the affordability! Though, if you’ve ever opened a package of drop cloth, you know it certainly doesn’t start that way. It takes some serious work – and unfortunately – some chemicals. Before I go off on my particular dislike for bleach, and how I’ve combated it’s eye-itching, skin burning, migraine inducing aftermath – let me show you some of the things I’ve made with this lovely light and creamy textured fabric (after I’ve bleached the heck out of it). Then I will share my method for how to bleach a drop cloth. 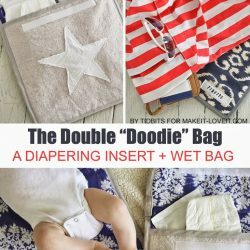 When my youngest baby was about to be born, I made this portable diaper bag insert + wet bag with drop cloth on the outside and laminated cotton on the inside. It is waterproof to hold any wet icky messy clothes or diapers while on the go. The drop cloth created a lovely but sturdy neutral cover – I call it “The double-doodie bag”. You can find the tutorial HERE. 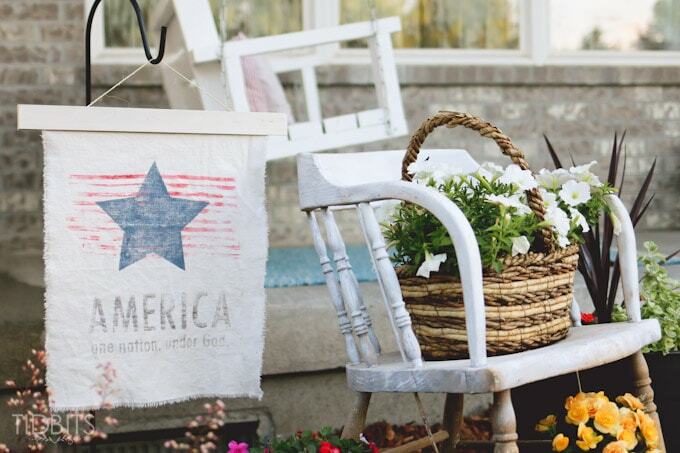 I also used bleached drop cloth to create this vintage, time worn feel to a patriotic garden flag for our front yard. Tutorial for that is HERE. 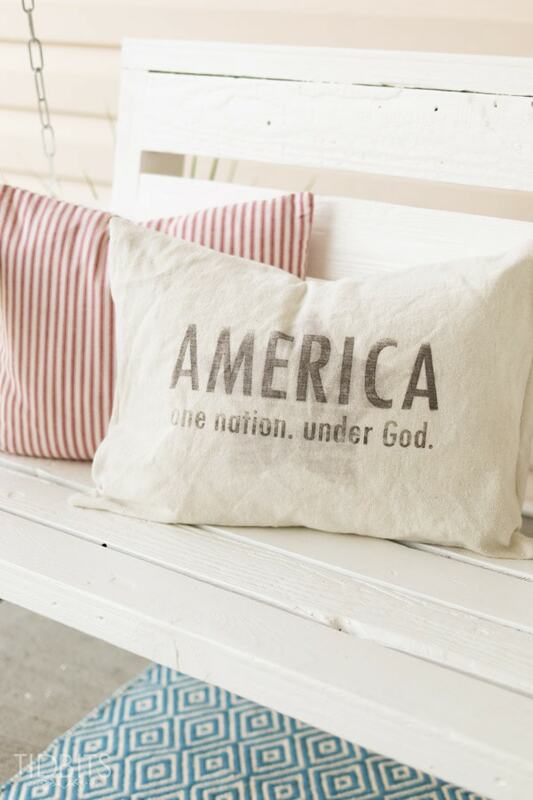 I used a simple ink transfer technique to place the AMERICA wording onto drop cloth for the flag and THIS pillow. I used some of my drop cloth stash to make a few of the fishes for our kids homemade fish game – which was a huge hit. Link for that, HERE. 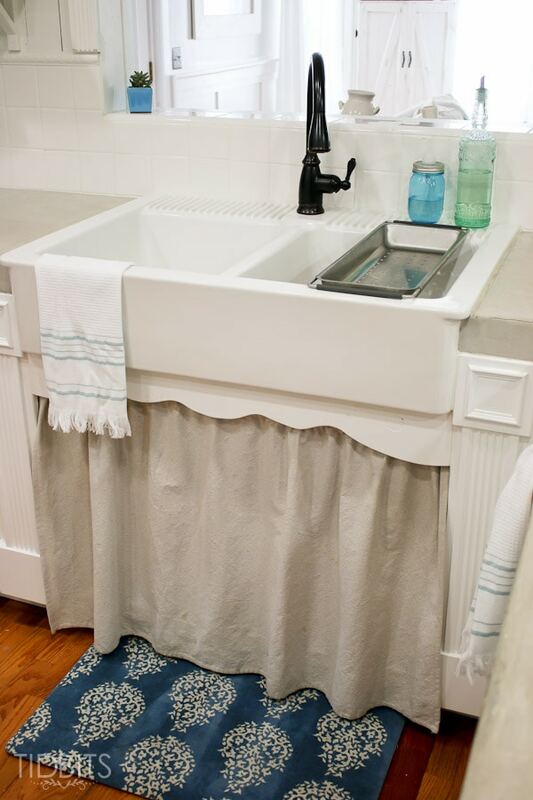 I used bleached drop cloth for our kitchen’s farmhouse sink skirt. Love it! This batch I used only half the amount of bleach (which I will discuss below) and you may see it is not as light as other projects. And most recently (and why many of you asked how I do it), I used bleached drop cloth to make our bed skirt for our master bedroom. Tutorial HERE. As well as for the grain sack decorative pillow on our bed. 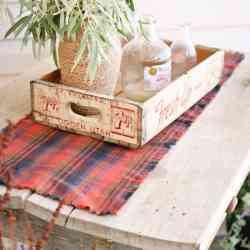 There are really so many things you can do to drop cloth once you make it soft and pretty. But from my experience, it does require bleach. I hate HATE bleach. I am super sensitive to chemicals and my skin will literally burn and I snap right into a migraine if I have to be around bleach for too long. But thanks to my sister’s genius suggestion awhile ago, I found a way to bleach the fabric – without a drop of bleach entering into my home. So, I took my sisters advice, gathered my quarters and snuck into the local laundromat to do my bleaching. I know – probably not too courteous. But in my offense, I’ve done it twice and never seen a single soul doing laundry so they probably really needed my quarters 😉 But by using the laundromat’s machines, I could let it soak in the bleach and not be around for the headache, and bring it home all rinsed, dried and ready to use. So that is my little tricky tip for you if you can’t tolerate bleach as well. I’ve made a little printable card for you to take to do your bleaching, but let me explain things a bit. To get your drop cloth a super light color, it takes about 8 cups of bleach in a full washer load. If you bought the extra extra large drop cloths (about 12 x 15 feet) it will work best if you split that in two, and bleach separately in it’s own cycle. Basically, one full load of drop cloth to 8 cups of bleach. You are going to fill the washer with water and stop the cycle completely. Then you add the bleach and let it sit for 3 hours. After the soaking is done, continue on with the cycle and repeat a normal washing cycle 2 times with detergent. This should rinse the bleach out enough, but you can go a third time if you want to rinse even more. The steps are spelled out more clearly in the printable below. Be sure to not allow bleach onto your skin – which is why I always wear rubber gloves. Some have asked me if I noticed the bleach weakening the fabric at all. I have not seen a problem with that yet. I would just suggest you be sure you are dumping the bleach directly into the water rather than pouring in direct contact with the drop cloth. If it hits in one spot it will most likely eat through the fabric, but if diluted in water it doesn’t seem to do that. Also, please note this is my method I have found to work best for me. There may be other methods you may want to compare to as well. Bleaching a drop cloth is an affordable way to achieve a textured, linen-like, neutral piece of fabric for use in many crafting and sewing projects. Drop cloths are generally a very stiff piece of fabric, but following this process you can have yards and yards of soft, use-able material. Shake out the painters drop cloth from it's packaging, and insert it inside a top loading washing machine. Only fill as much drop cloth into the machine as fits comfortably and will not overload the machine. If you bought an extra large piece, you will need to split it in half and complete the process twice. Turn the washing machine on a regular cycle until it fills completely with water, submerging the drop cloth entirely with water. Open the lid of the washer and stop the machine before it continues the washing cycle. With your protective rubber gloves on your hands, measure 8 cups of bleach and pour into the water. If the drop cloth is not completely submerged, gently use your gloved hands to push it back down. Let the drop cloth sit in the bleached water for 3 hours. After that time, turn your washing cycle back on and let it mix, spin and drain the water. Run your drop cloth through 2 more complete cycles of washing, with your regular detergent included each time - but NO bleach. To be especially thorough, consider a third time. Insert the drop cloth into a dryer until dry. Feel free to ask me any questions, and I will be happy to answer as best as I can! P.S. I buy drop cloth at Home Depot or Lowe’s. Thank you for sharing your process! Do you use cold, warm or hot water? I moved in March and covered my floors with drop cloths for two months. All the traffic softened them up, I washed them and now I’ll bleach them. I never thought of bleaching them. Thank you again! Your welcome! I use warm water, but I really don’t think it would matter much if you used cold or hot. How great that you will be able to make use of the drop cloths again. How do you manage to leave your drop cloth in the washer at the laundromat for 3 hours? Do you leave it, stay…? I would love to try this as I have a HE top loader that doesn’t “soak’. I do leave them all alone 😉 I figure if someone wants to steal my bleach saturated cloths they can have at them. I kind of worried I might get a rebuking, but I seriously never saw anyone go in or out. If you are really worried you might want to call the owners and get an okay first. I would simply make sure it was not that busy at the laundromat. If you live in an apartment complex, some laundry rooms are accessible 24 hours/day. You could put it in at 5 AM and go back to bed and when you have finished your morning coffee, it will be ready for you to start the next steps and you will probably not be in the way of too many people. For projects like this, I generally try to remember how I would feel if someone was bleaching 3 drop cloths and I needed clothes for work. I also would try to be nearby- in my car or at the coffee shop next door so that I could notice if things got busy. I would think that if you have your own machine, that the smell would not be too bad if you took it home after the first complete cycle, though you would need to be careful touching it if you are at all sensitive to bleach. So good to know! I have one waiting to be used. 🙂 Thanks! What brand of drop cloths do you prefer? I get mine online from Harbor Freight tools for about $7 each (4′ X 12′) and have used them for curtains throughout my house! I am considering drop clothes for curtains in a room with a lot of Windows. I would like to bleach them. I am concerned they will not all be the same color after bleaching. Has anyone tried bleaching several? Did they all come out the same color? Nice but with the price of a dropcloth being about $23, and the bleach used and time invested… I don’t feel like I’m getting a bargain or saving any money doing this. I could just as easily purchase the linen at JoAnn for $4.00 a yard. 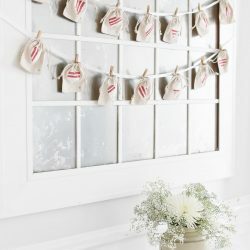 Hi, I thought the drop cloth was a good idea until I read your email. For me, Joann’s is the way to go and you get real linen. Thanks for your idea! I mean don’t get me wrong, It’s a great idea if you happen to have an old one lying around, but I don’t see myself purchasing a dropcloth just to go out and do this. Unless the finished result has some texture that isn’t found in purchasable Linen? I can truly appreciate your skepticism. I agree, you do have to consider if it is worth your time and effort. 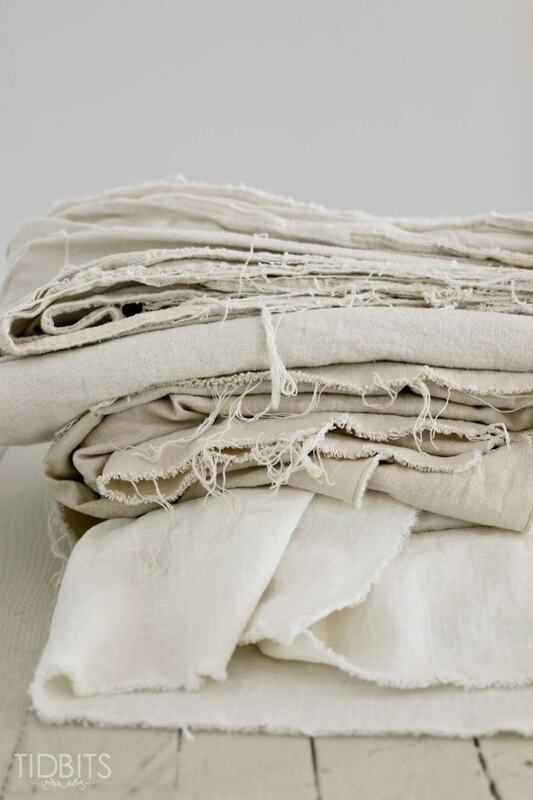 I absolutely love real linen – but the drop cloth has some properties when it is washed and/or bleached that make it irresistible as well. I can buy the extra large cloths for 30$ (at lowe’s) and I am estimating, but I imagine I get about 10-15 yards. 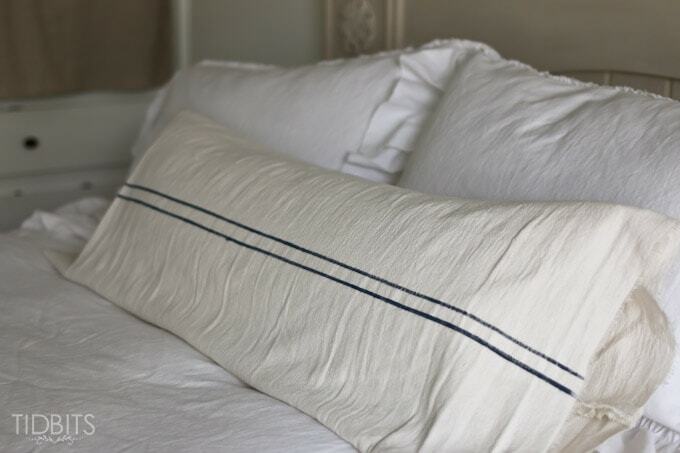 When it is washed and bleached, it looks and feels very close to old grain sack material and is great if desiring a vintage look and feel that new linen just does not have. Of course, you would have to try it for yourself to determine if the process is worth it to you – but I love this stuff for vintage looking pillows and such – and the color tone for my bedskirt is dreamy to me. I thank you for adding your input. I think it is very important to weigh the pro’s and con’s. I appreciate your reply, too. 🙂 I had to wonder if maybe there was a texture that could be achieved this way that could not otherwise be purchased. I think I was coming from a place of ‘ooh, is this a cheap alternative?” because at first I was very excited, and then I went to see what dropcloths were going for on Amazon. I buy mine from Harbor Freight for only $15.00. Best prices on paint brushes and so much more. I was just going to suggest that! My husband and I go to Harbor Freight all the time. I just discovered their drop clothes and they are really cheap. I think like $8 for a good size one and $15 for a really huge one!!! An they look like better quality than some of the ones I have seen in more expensive hardware stores. Once I saw them I knew I had to start some projects!!! Be careful comparing a 4$ cheap linen from Joan’s to good quality linen. Joann does not carry real linen. They have a cotton that is woven to feel like a cheap linen, but real linen is pricey, and not a bargain fabric to be picked up anywhere. Joann DOES carry 100% linen, but it’s not inexpensive and you have to read the end bolts to make sure it’s linen and not linen/rayon. if it’s less than $14/yard, it’s not linen. however, the linen they carry is not as heavy weight or textured like the cotton drop cloth, so it’s not really a substitute. if you bleach linen/rayon, expect the rayon to dissolve. a note on bleaching, vinegar is useful for removing the bleach from your fabric (and your skin if you get any on you). it neutralizes the bleach. i use it instead of fabric softener. you could also bleach with something like Oxy-clean, but that requires more work and drying in the sun. Friendly warning – Please don’t mix vinegar and bleach!!! The chemical reaction between the two is very well known to be a toxic chlorine gas which can cause breathing problems. Regarding the front loaders, couldn’t you fill it and then pull the plug and let it sit? I’ve never tried that – but I have tried adding water to soak cloth diapers. I always have a hard time completely submerging them, so I didn’t think it would be a good option for bleaching something. I have done this minus the bleach. I just washed it a few times. Put it in the dryer. I took the drop cloth out of the dryer right away. Put it on my table and it looks and feels like a linen table cloth. I really love you’re ideas! Just a suggestion here. If you do heavy bleach in the laundromat’s washers could you please then run the washer again empty so it’ll wash out the remaining bleach. There are those of us who must do our laundry there and the residual bleach ruins our good clothes. Thanks! great idea,I think most laundromats ask you not to use bleach in case some of it is left in the machine after you’re done.Also, why 8 cups of bleach? that seems like so much- And have you ever dyed them, with Rit or any fabric dye? just curious.hoping to learn from others’ mistakes. thanks for the info. Yes, I know some do ask that. I like to run an empty cycle before I go to prevent that. 8 cups is a lot! I tried doing half that once and it just didn’t get to the white I wanted and I had to do it again. 8 cups pretty much kills all color 😉 No, I have never dyed them. I have not had much success with Rit dye and don’t use it much. I would think that running the washer 2 more times with detergent per the instructions would get ANY leftover bleach out of the washer before the next person uses it. Osnaberg fabric which looks like linen at Joann’s is $4.99. Linen is $14.99 and up. So bleaching a drop cloth is the better way to go. Osnaberg frays and has no body to it. i CAN SEE THIS MAKING SENSE OVER STORE BOUGHT FABRIC FOR LARGE PROJECTS LIKE HEADBOARDS, FABRIC ONLY COME IN ONE WIDTH. I am laughing at all of the bleach hate 😉 But, I love the drop cloth bleached idea. TIP, vinegar, ( any vinegar on hand will do, ie; white. apple cider ) just a tish in a cup of water, will instantly “neutralize” clorox ! I had no idea about the vinegar! Can’t wait to try it next time and see if it helps with any remaining clorox smell or effects. Thanks for taking the time to tell me! Peroxide also neutralizes the bleach. If you dont neutralize it, the bleach keeps “working” and will deteriorate your fabric. Tried this In my bathtub so I could still use my washer for normal loads and I could turn on fan for the smell. pulled plug let it drain then ran a tub of water used vinegar to neutralize bleach. Let drain again squeezed out water slopped it in a plastic tub then put it in my washer and ran it a couple of times. Worked well bonus…clean tub! This is what I was thinking about doing. Thank you for sharing! Be careful with bleach in your tubs and sewage systems. Its harmful to both. so is it that the people are adding the vinegar TO THE 8 CUPS of bleach? The vinegar AND the bleach at the same time? I would NOT add vinegar to bleach! Sometimes chemical reactions occur when adding stuff together and I would not want to breath that concoction in! Wash with vinegar after the bleach wash to neutralize the bleach smell. Great suggestions! Thanks for your input! Can you typically wash a 9 x 12 drop cloth in a top loader? I Have, but one at a time. Hi! Thanks For Sharing this, I’ll try it myself. I was wondering if we supposed to use hot water or just cold water to bleach the drop cloth? I have been trying to get my drop cloth white- so far I have ended up with off white. Used a gallon of bleach and soaked overnight . Also used color remover. I bought the drop cloths at Walmart – they were a beige color. What color were yours to start? Thanks. Did you ever get yours white? I just bought some today and tried- soaked it for four hours. I am not sure they got any lighter lol definitely softer. But do I need to do it again? Where did you see linen at JoAnn for $4/yd – I’m seeing $25.yd? How much to the drop cloths shrink in the dryer? I do all my bleaching outdoors (I use big home depot buckets if I need to soak things. Bleach is very toxic and corrosive, and is bad for your lungs. I have all white tea towels and hot pads so I use bleach quite often. I find it best to fill the washer with water and the requisite amount of bleach and let the washer agitate to mix the solution consistently. Then I add my laundry and let the washer agitate until the fabric is completely submerged. It eliminates the need to worry about the bleach being too concentrated on any one part of fabric. If you wash and dry your drop cloth first it won’t be as stiff and it will wash out the coating or sizing that keeps the paint from soaking into it. Before bleaching run your drop cloth through a wash cycle so it will be damp remove from washer then fill washer with bleach and water solution it will bleach out quicker because you have washed out the coating or sizing on the drop cloth. I have my drop cloth in the wash as I’m typing. May I ask what setting you use when drying to avoid the worst of wrinkles?…cool, just until dry or a warmer setting? Thank you! Hey. I did this- soaked the drop cloths overnight and washed/dried them this morning. Parts of them are gorgeous and white. But they definitely didnt bleach evenly. There are still darker canvas “swirls” throughout the fabric. I had them completely submerged…. Any suggestions? Repeat the process and hope it catches the darker parts? I’m also having this issue! Any way to fix it?? Even if fully submerged, a bubble under the fabric will cause the uneven color. That what I’m noticing while doing this. Soaking mine a second time. Ok, i felt inspired. went to the hardware store and bought a dropsheet. Put a few litres of bleach in the bath with HOT water and left all day. I rinsed in the washing machine and left on the line all day in the sun. The smell of the original dropsheet has gone but no change to the colour. Very disappointed. The fabric will make good heat packs with my wheat but no good for decor. I am thinking about making a slipcover for my sofa. 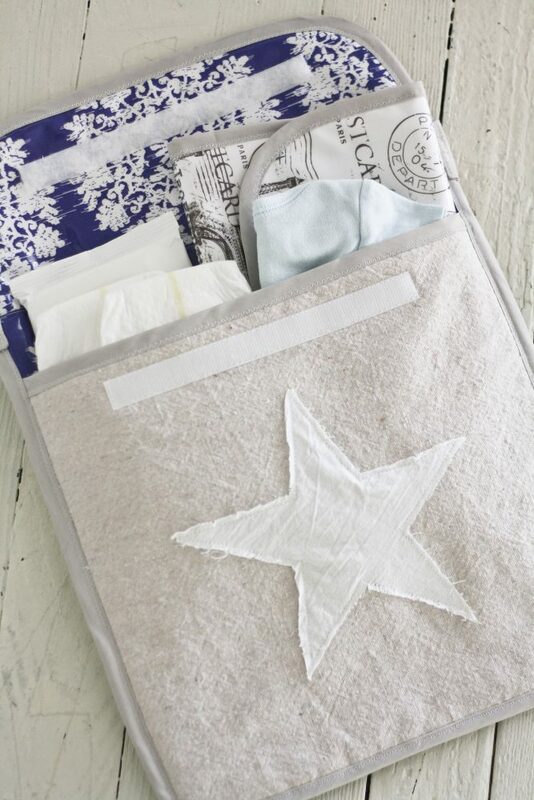 I love this idea of bleaching drop cloths! My question is, do you think the fabric would be sturdy for slipcovers? The sofa is rarely used. (No kids, only 2 small dogs). Yes, I do think it will be just fine. I have kids, and it has held up well. They have different weights of drop cloth. I would recommend buying 10 lbs fabric versus the 8 lbs variety. Best of luck! Let me know if you give it a try! Hi! I have a quick question. I want to try the “8 cups of bleach” method to bleach dropcloths that I intend to use for curtains. What size dropcloth do you use when you do this? I want to get the correct ratio of bleach-to-cloth so I don’t have do to this twice!! I have a 4 seasons room and I’m going to cover my cushions in drop clothes and add colorful pillows to top it off I love this idea. Thank you for the help with bleaching. I tried bleaching my drop cloth, I might have done something wrong so it didn’t came out soft or light. Also it resulted into dark and light spots of bleach. Although I did finished washing it and then drying it out. My question was that can I make the slip cover s first and then bleach it once again? That’s shouldn’t make any difference right? I was concerned about the fitting of the slip covers, if I will bleach it after stitching. Hi. I just want to add some FYI to this discussion when using canvas drop cloths for any sort of sewing project. It is vital to prepare your cloth before any sewing is to be done. Drop cloth is made of loosely woven canvas fibers that is coated with chemicals to prevent paint from leaking through. When you wash any kind of canvas or canvas-like material, it is going to shrink………….a LOT. So if you don’t preshrink your fabric, if you are sewing seems, like making a pillow, when you wash the pillow it will rip apart at the seams, due to shrinking. I wash mine in hot water, then dry……..then do it again. Even, it will shrink some more unless you cut the factory seams completely off before washing. The seems only allow the fabric to shrink so far. After I wash mine twice, I cut it up into the sizes i need for pillows, but with an added inch larger than I need the cut dimensions. Example: if I am making an 18×18 inch pillow cover, any other fabric my cut dimensions would be about 19×19 to allow for seamline. But with the drop canvas, I cut them 20×20. Then I flash cure them in the oven and they shrink anywhere from 1/2 to 1 inch more. I have yet to find a tutorial on drop cloth pillows that mentions this in the directions. Sadly, I had to find out the hard way and lost about 6 christmas pillows that I made for people. To flash cure, I do it the same way I flash cure the pillow panels after I paint graphics with cheap acrylic paint or ink transfers. Heat the oven to 450 F. Prepare a large baking sheet by placing a clean, thin cloth (I use the flour sack dish towels from Walmart…….love those things) down on the baking sheet. It will drape over the sides, which is what you want. Place the pillow panel flat down in the pan, then loosely fold the sides of the dish towel, that are hanging over the sides of the pan, over the top of the panel. Make sure it covers it completely but loosely. Slip the pan in the oven on center rack and TURN OVEN OFF. Set timer for 10 minutes and do not open the door until time is up. 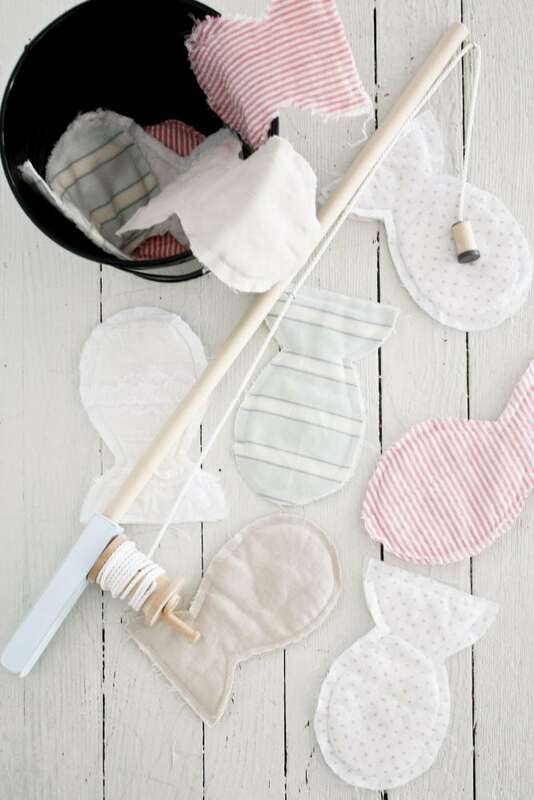 This not only pre-shrinks your panels but will also set paint/ink so it doesn’t come out in the wash.
I’m curious about the striped grain sack pillows. Where do you buy the material for those and can you find some that are inexpensive? Never mind – I found the tutorial on painting the fabric. I’m loving your website! Just discovered it yesterday. Not sure how it would affect the fabric, I’d sample first. Nice article! I’ve always wondered if this would work. 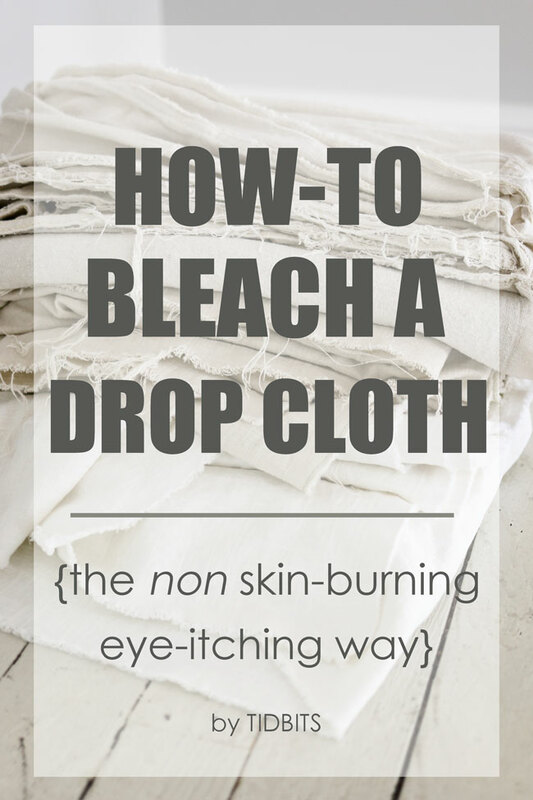 After my recent failures to bleach drop cloth I’ve been researching how others do it. The one thing that stands out is that your drop cloths must be %100 cotton and not a blend. I just tried bleaching 4 6×9’s in a large bathtub with a whole bottle of bleach and they appear to be the same color as before soaking for almost 24 hrs! These are the ones from Home Depot and are definitely a blend. I will be trying again with some all cotton ones. The type & blend of the drop cloth is what makes or breaks this process. I bought a small blend (cotton/poly) from Lowe’s. Bought a small all cotton from Harbor Freight. If it doesn’t say “cotton”, it is a “blend”, and they will bleach differently. I washed them together in warm water & detergent to get the “fabric sizing” out of them. I wanted pure fabric. I took the damp fabric out, filled the washer with warm water and one full gallon of Walmart brand, lavender scent bleach. Let it agitate. While it was still agitating, I lowered in my wet drop cloths, put it on medium speed for the 15 minute cycle. Did not let it drain out. Then I reset the washer to wash again, but stopped it after a couple of minutes & just let it sit. I did this for the next 12 hours. It sat overnight, and the next morning, the difference was dramatic!! The cotton fabric was very, very white. The poly blend was a wonderful creamy white. I dried them both to the warm stage & hung to finish drying. DO NOT USE FABRIC SOFTENER. Fabric softener is petroleum based and leaves a residue in the fabric. The poly blend was soft and wonderful. I loved it. The cotton was very white and not nearly as soft. But I wasn’t done playing. I cut them in half and dyed the two of them in the same dye bath of dark brown + a little black. The cotton/poly blend took the dye beautifully. It was exactly the color I was looking for. The all cotton, not so much. It came out a lighter brown, not a rich color at all. It’s still usable for another project, but not what I wanted. I had never used drop cloth before, so it was really necessary for me to see what happens when you “play” with the fabric. You don’t want to go through the time, expense and trouble of a desired project, to find that the fabric isn’t behaving the way you want. Now that I went through this, I will forever know how to use it and what to expect. Thank you for the info on your experiment! Love the whole idea of white, soft drop cloth material for projects. 1. Have you tried any of the non toxic/natural bleach options out there? 2. Did you have any problems with fraying? I noticed while making my slip covers that it loves to fray and fall apart. I don’t have a serger but I did the closest stitch available on my sewing machine to close up the Edges. The only drop clothes I can find have the plastic coating on the back. Where can you find the ones you use? I want to make some slip covers for my couch and chair. You can buy cotton duck that is already white for the same price, generally, as getting it in natural. It is rather interesting to me to note that I should look for a poly blend of dropcloth, if I intend to use it toward covering a sofa or making pillows, because I would want them to be soft and at least fairly white, even if I plan to dye the material later. I have only bought cotton duck before for it being sturdy enough like making totes, purses, photography backdrops and other things that require stiffer materials. So, did it get soft after bleaching it? I always ‘serge’ (straight stitch fast two lines) along all of the edges before I prewash, to reduce any fraying that may occur. I prewash my materials on warm or even hot to hopefully get all the shrinkage out of the way, and I dry them fully on high in the dryer to fold right after to help reduce the wrinkles that can occur otherwise. (However, I use cotton fabrics for the most part.) it. I think I will try bleaching a poly blend of dropcloth in the spring, so I can do it in a bucket out there. Thank you all for all these helpful tips! Hello! I need some help… I bought a drop cloth and have it sitting in the second batch of bleach it’s been on there about 4 hours and is not changing color AT ALL!! any advice? I purchased all cotton drop cloths (4 of the 9×12’s from Amazon) and without a top loader or a laundromat near by, used new storage tubs. I used 6 cups of bleach per tub and 9×12 cloth and soaked (agitating them by hand every 30-45 minutes) for 4 hours. They definitely had splotchy tan spots of their initial color. Will try again in the morning to soak again (need more bleach first) and am considering trying to fill a tub. This is such a messy process without them being in the machine!!! If anyone has any additional helpful tips, I would love to hear them! !